The name Riverhills was chosen after consultation with members, staff and the wider general public, who suggested a variety of names. However, Riverhills stood out due to its links to the location of the Health Club and Spa, which stands on a site known as River Hill at Bramford, Ipswich. There will be no effect on our past and future members and guests as the high-level service that they enjoy will remain in place, as will the management and staff. Although our trading name has changed to Riverhills, our legal entity remains unchanged as Clarice Leisure PLC. It is absolutely “business as normal” and all previously purchased gift vouchers and appointments will be honoured, confirmed Stuart King. However you choose to relax, Riverhills is the perfect retreat. Conveniently located just off the A14 on the west of Ipswich, our classic country house offers a unique ambience, worlds apart from everyday concerns. Featuring an exclusive Health and Fitness Club, Day Spa and Hair & Beauty Salon, we have something for everybody. Health Club Members enjoy all of the Club facilities within their membership subscription, including, swimming pool, spa bath, sauna, aromatherapy and steam rooms, gymnasium, tennis courts and around 90 studio classes a week. All members receive a personal assessment and training programme on joining and benefit from as many re-assessments and re-programmes as they like at no extra charge. The Hair & Beauty Salon is open to members and non-members alike. We use the best products, including Keune, Germaine de Capuccini and OPI and offer a full range of salon treatments, including facials, massage, anti-ageing treatments, body wraps, holistic treatments, manicures & pedicures, gel nails, waxing and electrolysis. In addition we have an indulgent range of Day Spa packages, at prices to suit all pockets. All Day Spa packages include use of the spa facilities including swimming pool, spa bath, sauna, steam & aromatherapy rooms, at least 1 treatment and more depending on which package you choose, robe and towel hire plus flip flops to keep and a delicious lunch or afternoon tea. Riverhills, Health Club & Boutique Spa is located at Clarice House, Bramford Road, Bramford, Ipswich, IP8 4AZ. For more information about Membership, Treatments and Day Spa packages please visit www.riverhills.co.uk or call 01473 463262. 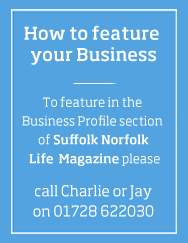 Each month in Suffolk Norfolk Life we feature a company from both Norfolk and Suffolk so you can learn a little bit more about what East Anglia has to offer.